'Jane Doe' has no idea who she is or why she wakes up in a...nursing home? Full of shifters? She may not be old, but they say she is a shifter—only her wolf is MIA and she's in some kind of trouble she can't remember to boot. And there's this guy, Ryder. Something about him that makes her tingle in all the right places. If only she knew whether or not she already had a mate, why she's been stashed in shifter 'retirementville' and where the hell her animal half went. 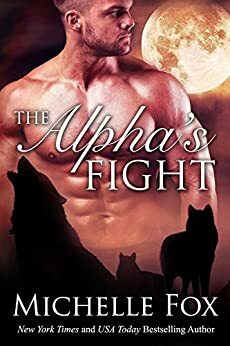 The Alpha's Fight is book 3 in Michelle Fox's Huntsville Pack series. It is a stand alone novel with no cliffhanger and tcan be read out of order, but some characters will cross over with the previous stories. 'Jane Doe' wakes up and finds herself in a nursing home full of shifters. Why is she there? Who is she? Why can't she remember anything? And why does Ryder, a perfect stranger, burrow under her skin like he belongs there? Ryder Chase has a plan. Starting his own pack and leaving his so called alpha behind, but Mason has other plans and wishes him dead before he'll let Ryder embarrass him like that. Then there's the other problem, Jane. Her appearance is a little too convenient for him to ignore as well as the fact that she knows Mason. Is she there to set him up, he needs to ignore his attraction in order to uncover the truth. The Alpha's Fight is my first foray into the Huntsville wolves and I have enjoyed getting to know the characters and I'm sure I will enjoy getting to know more as I read the rest of the series. I really enjoyed the setting, both the main and periphery characters in this instalment and how they interacted together. Jane Doe, whilst suffering amnesia, still seemed very strong, straight forward, accommodating and independent which was great and I loved her trying to rationalise her reaction to Ryder. It was also interesting to see this Fox's interpretation of what would happen inside a pack with a power hungry selfish alpha. It is a different dynamic and perspective then what I have previously read but no less important when reading about pack life. The violence in this story is surprisingly detailed in its descriptions in which I wasn't quite prepared for, but there is only a small amount of it when you consider the whole book. Im looking forward to reading some more of the Huntsville Pack. Definitely one to read - I haven't read the rest of the Huntsville Pack books but this still works as a stand alone book. 5.0 out of 5 starsAnother captivating read!! H-O-O-O-O-O-W-L What an epically WOLFTASTIC book and a FURTASTIC addition & continuation to the Huntsville Pack series!! Right from the cover I was swept right back into Pack Life, living, hunting, fighting, mating and everything else it all ENTAILS! Michelle sure was right when she said that this would be a book like no other! But then again, Michelle is an author like no other! The hilarity of the whole nursing home idea is ABSO-FURRY-LUTELY priceless!! The humor, the point of views from/by the wolves & the men, had me bursting out laughing more times than I could count! “the thong was a lot like dental floss in a very wrong place” HA! Add in the thrill of the fight, the chase, the mating, as well as the romance, friendships, amnesia, old biddies (not that I would say that to their faces! ), the mysteries, good vs bad, Alphas, Mates, family, and well, I could go on & on since there's just so darn much of PAWESOMENESS inside, but I won't. :-) Suffice it to say that this is one SHIFTACULAR story that you will NOT be able to put down! In fact I stayed up most of the night reading it and WOLF OH WOLF, WAS IT EVER WORTH IT!! I firmly believe that Michelle Fox is really Michelle Wolf! While she is definitely Foxy, her ability to transport you into the story so that you are living & experiencing it both with & AS the human side of the characters, as well as have you doing the same as the Wolf side, proves beyond a shadow of a doubt that Michelle is indeed one uber talented author! With the attention to detail, the histories of the individual characters & the packs, the thoroughness of the building & development of the world, the characters as well as all of the storylines, it all enriches the story & the series bringing to it a level of depth that defies description, turning a great read into the experience of a lifetime, that you hope never ends and that you wish for it to all be real! How can it NOT be real?!? This is what made me fall in love with Michelle and her books. This is what keeps me coming back for more. What has me eagerly checking my emails, her website and social media waiting for word on my next journey, my new book mate (no book boyfriends for me! ), the chance to catch up with my friends. In other words, waiting for the next exquisite Michelle Fox masterpiece of a treasure to transporting me back into the worlds that I love so much!